Mom's Gone Bronson! : Protein Energy Power, in BANANA! Disclaimer: I was provided with products in order to share my honest opinions. Your views may differ from mine, thank you! I am currently on Nutrisystem and they provide some shakes, which I like a lot, but I was looking for other shakes that came in different flavors, which complimented the Nutrisystem plan. 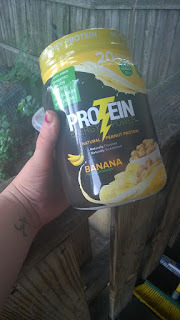 I was given the chance to try out this natural, plant-based protein supplement (Protein Energy Power) and so gave it a go for a couple of weeks when I ran out of my regular shakes. I really enjoyed the texture, even when made just with water (you can make it with water or add milk) and it tasted just sweet enough that it wasn't too much and it didn't leave any lingering aftertaste, which I can fully appreciate! I really enjoy the banana flavor and would definitely use this again in the future and will give it a full 5/5 as I can't seem to find anything to fault it on! If you are looking for a supplement that keeps you going at breakfast or puts a pep in your step for a workout, or if you'd just like to add something new to your routine, then definitely give this one a try! You can find out more about Protein Energy Power across social media for more ideas on how and where to use it and you can find it from good retailers, today! I haven't tried banana yet, but I do love adding a protein shake int my daily routine. I think I need to try this banana favor. Oooo banana flavored protein powder?! That sounds really good! I wonder if they have a chocolate one too? That would taste yummy mixed together. I love banana and drink a protein shake every morning. I will have to see if I can find this. I have been contemplating using Nutrisystem your posts inspire me more.